Uranus is a strange, giant planet tilted on its side. A new study finds that the same impact that knocked Uranus sideways may have also created the planet's moons. This image shows Uranus in false color as seen by the Hubble Space Telescope. NEW ORLEANS — The giant impact from an Earth-size rock that knocked Uranus sideways may have also helped create the tilted planet's moons, a new study finds. The poles along which Earth spins are mostly pointed the same way as the poles of the sun and nearly all the other planets of the solar system. 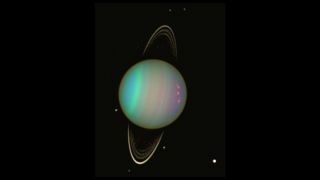 However, Uranus is an oddball in that its axis of spin is tilted by a whopping 98 degrees (relative to the plane of the solar system), meaning it essentially spins on its side. No other planet in the solar system is tilted as much — Jupiter is tilted by about 3 degrees, for example, and Earth by about 23 degrees. Uranus possesses 27 known moons. Eighteen of these moons orbit around the planet's equator, and these "regular" moons make up 98 percent of the total mass of Uranus' moons, said study lead author Yuya Ishizawa at Kyoto University in Japan. The other nine moons are "irregular" in that their orbits are skewed away from Uranus' equator, and prior work suggested these moons were captured after Uranus formed. In computer simulations, the researchers found that an Earth-size rock striking a newborn Uranus could have helped give the planet its current tilt. At the same time, the simulations found that the rubble from the impact could go on to collapse and form moons with orbits and masses similar to those of Uranus' actual moons. Ishizawa noted that the researchers' initial simulations did predict the formation of a number of moons that would orbit Uranus at distances closer than planet's actual moons do today. He suggested that further research should investigate how the orbit of such moons might decay over time and potentially end up destroying these moons, explaining their current absence around Uranus. Ishizawa and his colleagues detailed their findings Dec. 13 at the annual meeting of the American Geophysical Union in New Orleans.